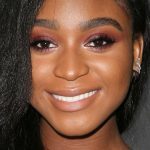 Normani attended the WiLD 94.9’s FM’s iHeartRadio Jingle Ball wearing an Off-White Contrast Piped Top ($384.00), Yang Li Black Wide Double Trousers ($369.00) and Gianvito Rossi Glitter Stretch 105mm Booties ($522.00). 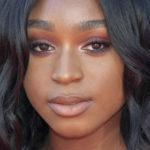 Normani attended the 2018 American Music Awards at Microsoft Theater in Los Angeles wearing a Carolina Herrera Spaghetti Strap Gown With Side Drape ($4,290.00), the Edie Parker Wolf Velvet Clutch ($1,495.00), a Rose 18k White Gold Diamond Akoya Pearl Ring ($7,400.00) and Rose 18k White Gold Diamond Ring ($7,050.00) both by Piaget, and Giuseppe Zanotti Ellie Metallic Sandals ($407.50). 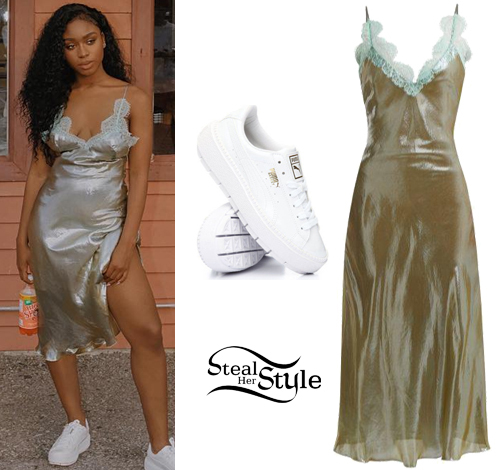 Normani Kordei Hamilton posted some pictures on instagram wearing a Maria Lucia Hohan Jade Lace-Trimmed Slip Dress ($335.00) and Puma Platform Tracer Sneakers ($110.00). 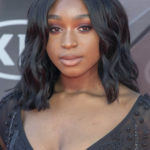 Normani attended the 2018 Billboard Music Awards at the MGM Grand Garden Arena in Las Vegas wearing a custom-made Lethicia Bronstein Dress (Not available online), a 14k Rose Gold Luxe Diamond Square Ring ($3,465.00) and 14k Rose Gold Black Spinel Square Ring ($2,065.00) both by Anne Sisteron, and Sam Edelman Ariella Patent Sandals ($99.95). 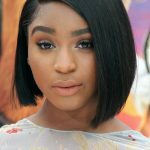 Normani Kordei posted a picture on instagram wearing a John Paul Ataker Stretch Velvet Long Dress with Stones ($1,100.00) with Balmain Studded Leather Diane Sandals ($2,595.00). 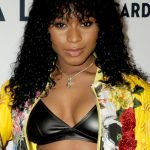 Normani Kordei posted a picture on instagram wearing Off-White Cycling Stretch T-Shirt ($635.00), jeans like the Topshop Moto Mid Blue Ripped Mom Jeans ($75.00) and Giuseppe Zanotti G Heel Sandals ($895.00). 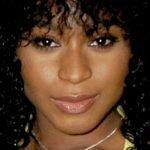 Normani Kordei posted a new instagram photo a couple of days ago, wearing a Selma Cilek Off Shoulder Top ($184.10). 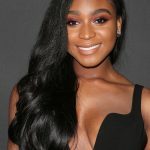 Normani Kordei met fans yesterday at the meet & greet for Fifth Harmony’s Toyosu Pit concert, as part of the PSA Tour. 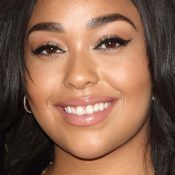 She wore an I.AM.GIA Kiko Dress ($90.00). 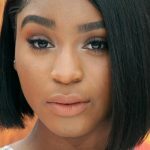 Normani Kordei was spotted arriving to the Sony building in New York wearing a Flame Funnel Collar Quilted Jacket ($1,280.00) and a Jersey Maxi Dress ($117.00) both from Fenty Puma by Rihanna, with ASOS Kenzie Slouch Over The Knee Boots ($72.00). Fifth Harmony made an appearance at the John John Store in Sao Paulo yesterday. 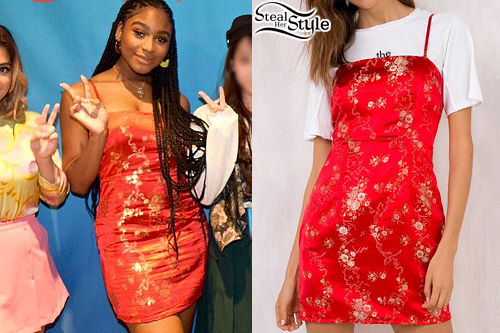 Normani was wearing a Paradise Dress ($254.00) and JJ Croco White Leather Sandals ($223.00) both by John John.